Some blog owners, who use Windows LiveWriter, may still be seeing the signs of the recent security update by Blogger. I get an error saying that it cannot log into remote server, and that my password/username are incorrect - although I have re-entered and they are correct. It appears that Blogger may have created a backdoor, to allow LiveWriter client access - which requires a new Google setting. One forum post suggests a backdoor setting, in Google Security, which appears to enable LiveWriter to login to Blogger. IT'S WORKING AGAIN!!! With a caveat - you'll get an error message about not being able to log in. After you do, check the Gmail account associated with your Blogger. 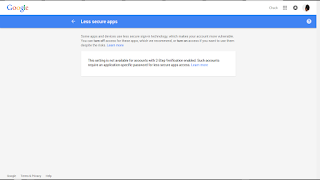 Open the link to control your access security settings (https://www.google.com/settings/security/lesssecureapps) and allow "Access for less secure apps." Then click the back arrow. Quit LW, then open & try again. 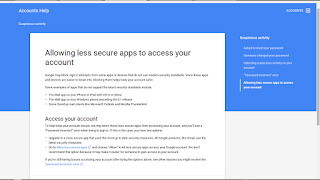 Click here for the "LessSecureApps" wizard, in Google Security. The setting provided appears to be global. If you have other apps which use ClientLogin, this may or may not provide a complete and safe solution. It's your option, to allow all applications which use Google to authenticate, to use the less secure "ClientLogin" process. If you are using Google 2-Step Verification, you can't use this new option. Some third party offline editors may still need to be upgraded - as it does not appear that the "Less Secure Apps" option is a built in feature in OAuth 1.0. Your experience, and feedback, is welcome. (Update 2015/12/16): Windows Live Writer has been replaced by Open Live Writer, an Open Source project. OLW will only work with OAuth 2.0, and is available for download. I continue to experience this problem. And it is slowing down my blogging efforts a great deal. I have tried toggling the Google security settings, both the "two step" setting, and the "allow less secure apps access." In an earlier attempt to fix things, I upgraded from Live Writer 2011 ti Live Writer 2012. Should I dump the newer version and go back to 2011? Just converted back to WLW 2011 in place of WLW 2012, and performance is exactly the same: NO GO. I'm really frustrated at this point. Convinced there is no solution to resolve the anomaly on my machine. I'm really angry, but I don't know who to direct the anger to. If you're still unable to use WLW, you need to be posting in Blogger Help Forum: Get Help with an Issue, so we can try to diagnose. We have no ability to cross reference your Blogger profile with your forum identity - so your best chances for solving the problem lie with you posting in the forum. Shall I Move My Blog, To Google+ Hosted Comments?